Our daughter has become attached to a security blanket that was given to us as a gift for our son, who is now 3 1/2. It is by Blankets and Beyond. 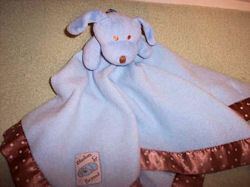 It is a light blue dog head attached to a blue blanket. The blanket has a light brown trim on it with cream colored polka dots. I have been searching high and low to find back-ups in case something happens to this one. Any help would be greatly appreciated! Know it has been a long time. Here is the animal version of the dog if that would help while the search continues. Sorry no exact match yet.